Dara joined PrimeCare in December 2016. She has lived all around the United States as an Air Force dependent and now calls Stafford, Virginia her home. She graduated from North Stafford High School in 2006 and attended George Mason University in Fairfax, Virginia where she attained a B.S. in Biology in 2010. 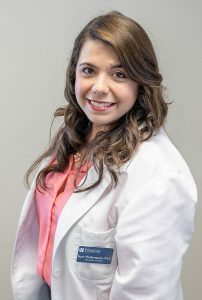 Following her undergraduate studies, she received a Master of Physician Assistant from Eastern Virginia Medical School in Norfolk, Virginia in 2014. She spent the first 2.5 years of her career as a PA in the Fredericksburg area providing primary care and has a passion for evidence-based and preventative medicine. Dara is a Fellow of the American Academy of Physician Assistants and a Fellow of the Virginia Academy of Physician Assistants. In her free time, Dara enjoys spending time with her family and attending fitness classes. She is committed to providing compassionate and personalized primary care to the community and is currently accepting primary care patients ages 12 and up. Dara is currently accepting new patients. To schedule an appointment, please call our office at 540-786-1200.